If you’d prefer to forage for food on a converted barge rather than wait in one more hellish line at Trader Joe’s, you’re in luck: Swale, the floating food forest founded by Mary Mattingly, will land at the Brooklyn Army Terminal in Sunset Park this summer from May through July. Pool and shuffleboard on offering. Photo credit: Industry City. Vincent Chirico, the chef and serial restaurateur behind Coarse in the West Village and Vai on the Upper West Side, opened a new restaurant today in Sunset Park’s Industry City. We got some photos and a copy of the menu. As ’90s “it” author JT Leroy once put it in a book title, the heart is deceitful above all things. But not as deceitful as LeRoy himself ended up being. Embraced as a hard-living, gender-bending literary wunderkind by everyone from Bruce Benderson to Bono, the troubled teen author was famously outed as a fabrication of Laura Albert, a somewhat less troubled 40-year-old woman. A new documentary about this bizarro episode in literary history, Author: The JT LeRoy Story, recently premiered at BAMcinemaFest– if you missed it there, Rooftop Films is offering another chance to see it, Aug. 18, with Albert and filmmaker Jeff Feuerzeig in attendance. Three years ago, Daniel Lopez injured his knee. The 37-year-old native of Mexico never had health insurance, so he waited until the pain got so bad, it wouldn’t allow him to work anymore. Only recently did he get surgery. His knee is still swollen. “It hurts,” he says. He can barely walk, much less work. But he wouldn’t miss a meeting of his United Handymen Workers Cooperative. Rising rents and changing neighborhoods got you down? 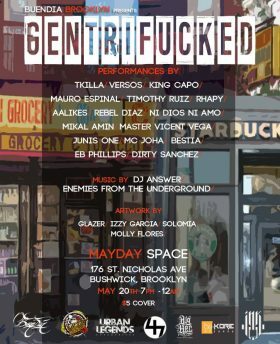 Tonight head over to Bushwick’s main-squeeze community space, Mayday, for an art and music fest to commiserate on our supremely “gentrifucked” city. Last night the mask-wielding artists of the Bruce High Quality Foundation opened up the doors of their epic new studio space in Sunset Park. The excuses were a party and an exhibition featuring work inspired by French Baroque painter Nicholas Poussin’s landscapes, while the reason was fundraising for the Bruce High Quality Foundation University (BHFQU), an experimental, non-profit art school that offers free classes and an alternative to the MFA by separating art from careerism. Come January, BHQFU, which has had a home base in the East Village since 2013, will move its operations here to Sunset Park. Sit back and enjoy some mind-rattling films screening this weekend and beyond. A new documentary brings us deep into the complex, overlapping layers of South Sudan’s contemporary social and political developments under the influence of Neo-colonialists, and get a sneak preview of an Austrian thriller rife with horror movie. And of course there’s more. Read on. 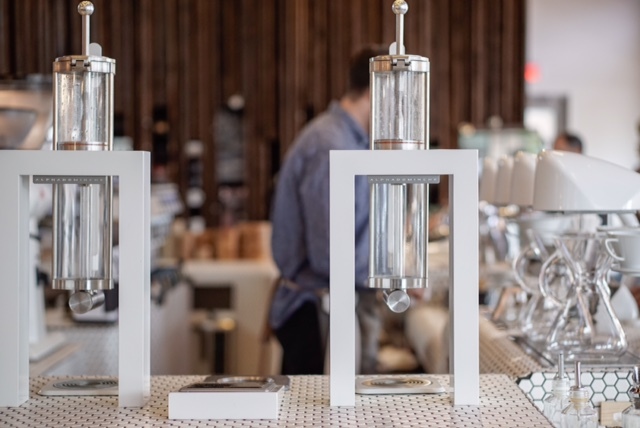 Sunset Park has been a contender for next “it” neighborhood since 2013, when the team behind Chelsea Market took over Industry City. The six-million-square-foot warehouse complex, dating back to 1895, used to be a thriving manufacturing and import-export facility but now looks almost abandoned with its broken windows and uneven alleyways. But the clamor of construction and the comings and goings of employees hints at dramatic changes afoot.